Dedicated/Direct thread do not accept adaptors. NOTE: M38 x 3.5 thread measurement is sold in the US and Canada only. 1. Refer to the insert/adaptor chart (below) to see if your lathe is listed. 2. 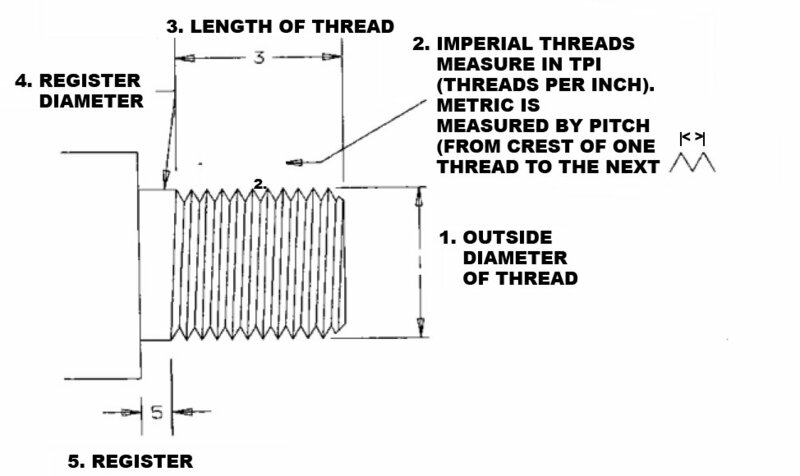 If not listed, look in your manual or sales literature to find the thread size. 3. If you don’t have a manual, contact your supplier to get a copy of your manual and find out your spindle size. If they don’t have the info you can call your manufacturer. (Then look at our insert/adaptor chart below to find your size). 4. If you have reliable information for your spindle thread size but there is no match on the chart, you may have an unusual lathe that NOVA doesn’t have an adaptor for. You will need to purchase a blank chuck or a blank insert/adaptor and get it threaded to your requirements. 5. If you can’t find the information on your spindle thread size you will need to take some measurements on your lathe spindle. You only need to do these measurements if you can’t find the info anywhere else. Ensure that the thread on the adapter and lathe spindle has the exact same pitch and standard. Even if the thread size is the same there are different standards of threads, e.g. UNC/UNF and BSW. If mismatching standard threads are used it may cause damage to both lathe and chuck therefore you will have to know the thread of the spindle accurately. Designed specifically for the NOVA Comet II Midi Lathe, features lock for the reverse function.